Race For Arizona's Open Senate Seat Gets Personal : It's All Politics For the first time in nearly a generation, Arizona voters will elect a new senator. Retiring Sen. Jon Kyl's ideological successor is Rep. Jeff Flake, a fellow Republican. But recent polls suggest Democrat Richard Carmona has a shot, and the race has become heated. Democrat Richard Carmona (left) and Republican Rep. Jeff Flake shake hands before Thursday's debate in Chandler, Ariz.
For the first time in nearly a generation, Arizona voters will elect a new senator. Republican Sen. Jon Kyl is retiring after 18 years. His ideological successor is Republican Rep. Jeff Flake, and a lot of people expected Flake to have an easy time of it. But recent polls suggest Democrat Richard Carmona — a former surgeon general and a Hispanic — has a shot at winning. The race has become heated, and the airwaves are filled with brutal ads. "Many call him the most conservative congressman in Washington," is how one ad proudly describes the Republican, who's from a pioneering Mormon family and who has served in Congress since 2001. The ad, paid for by Flake's campaign, portrays him as an early riser who goes jogging before dawn and prepares breakfast with his family before heading to work. It concludes: "Arizona's battle-tested conservative is Jeff Flake." If you're into battle-testing, though, Carmona's resume is hard to beat. He was born in New York's Harlem neighborhood of Puerto Rican descent. One campaign ad features Gary Clark, one of Carmona's Vietnam-era colleagues, describing the candidate as a "poor kid who quit school and got a second chance in the Army, became a doctor, SWAT team leader and surgeon general." Flake and the Republican Party have been tying Carmona to the Obama administration, not necessarily a helpful connection in a state Republican presidential nominee Mitt Romney is favored to win. 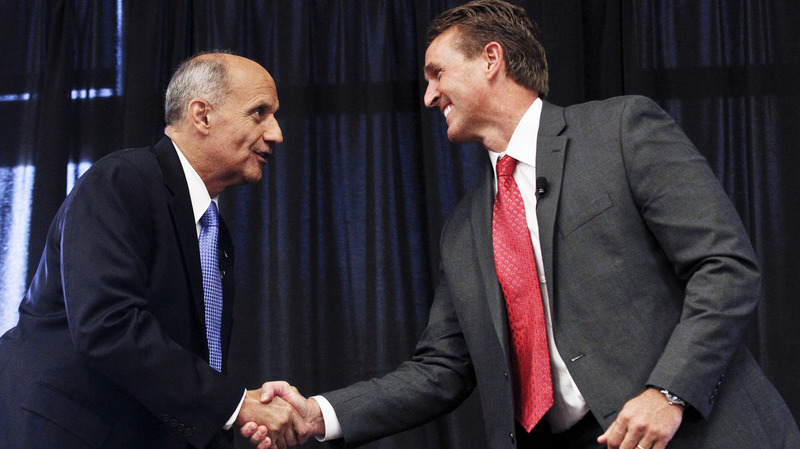 An ad released last month by Flake's campaign says: "Richard Carmona was recruited [to run for Senate] by Barack Obama. Jeff Flake is supported by Jon Kyl and John McCain," Arizona's Republican senators. Carmona, though, served for nearly four years as surgeon general under former President George W. Bush, a Republican. Until a year or so ago, he was a registered independent. In the past, he says Republicans also tried to recruit him for office. "In an old Republican Party, I might have been able to go with a fiscal conservative approach and smaller government. I'm OK with that," Carmona tells NPR. "But when you look at what's happened in our state and the nation and where the Republican Party has gone, most of my friends who are moderate Republican friends are embarrassed that we're attempting to legislate contraception, defunding Planned Parenthood." Carmona is playing the moderate to Flake's conservative stance. Sensing a possible upset, the Democratic Party has spent at least $1 million on ads portraying Flake as too conservative, even for Arizona. They've attacked Flake's positions on abortion and contraception, and highlighted a few of his votes on veterans. Flake says the attacks are exaggerated and misleading. "Some of the accusations about me and veterans' benefits and women's issues and things like that — I think at one time they were saying that Jeff Flake wants to return to the time before women could vote," Flake tells NPR. "That gets personal." Last week, conflicting polls showed each candidate slightly ahead. The already tough campaign got really personal. The Flake campaign and the National Republican Senatorial Committee released an ad aimed at women, attacking Carmona's temperament. Dr. Cristina Beato, former acting assistant secretary of health between 2003 and 2005, looks into the camera and says Carmona has problems with women, and with anger: "There was an angry pounding on the door in the middle of the night. I'm a single mom. I feared for my kids and for myself. It was Richard Carmona, and I was his boss. Carmona's not who he seems." Beato concludes by saying, Carmona "should never, ever be in the U.S. Senate." Carmona denied the charges. Earlier this year, his campaign manager told Politico, "Dr. Beato's claims are complete lies." Carmona called Beato troubled and countered with his own ad featuring Kathleen Brennan, a retired police captain who was his SWAT team commander, saying Carmona was a "joy to work with" when he served in the Pima County, Ariz., sheriff's department, and that he "treats everyone with respect." "When I see a career politician like Jeff Flake attacking Rich Carmona, who has spent his life helping others, it's despicable," Brennan says in the ad. Carmona didn't help himself in a debate Thursday night when he told the male moderator that he was "prettier" than CNN's Candy Crowley, who moderated Tuesday's presidential debate. Republicans pounced. Carmona apologized. There's no telling what the effects will be. Early voting has already begun in Arizona.